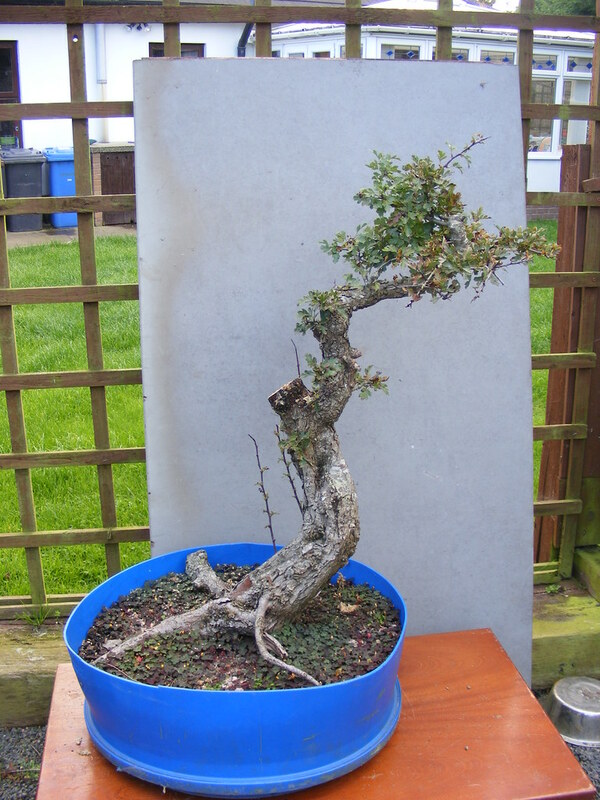 Back in March 2010 I decided that this collected Hawthorn needed to be reduced to one trunk line. 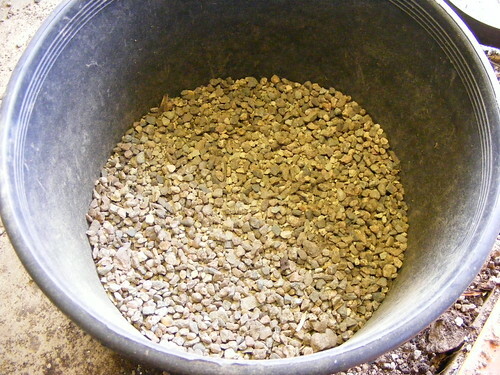 It is now well established in the training pot and had produced strong growth. It seems a shame to just cut off the second trunk which had some nice bark and movement. I promised myself this year that I would try and exercise more patience when working with my trees and always look for the longer term benefits. No more quick fixes. I therefore made the decision to air layer off the surplus trunk. On a sunny afternoon in March Philip Stephen and I set about getting the tree layered. Below is the tree before starting the process. 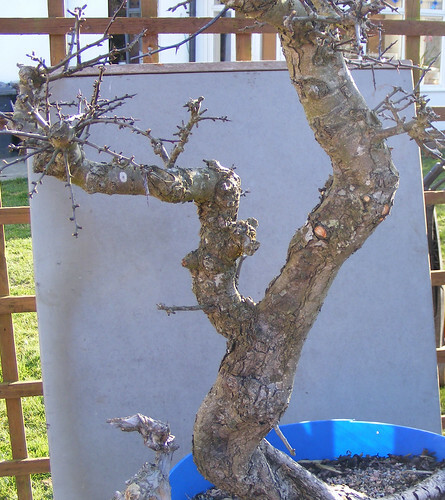 Next step was to remove some of the smaller branches that were getting in the way. 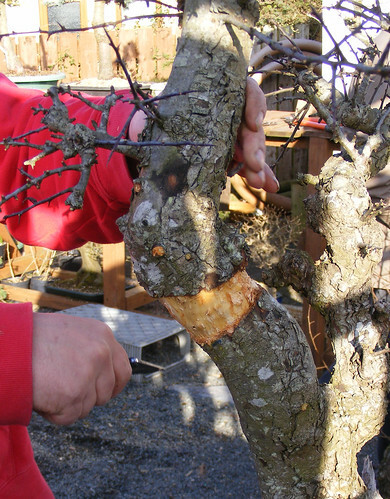 Next we mark out the area of bark to be stripped away. This was done with a marker so adjustments could be made. Next we strip away the area marked out. You need a sharp knife at hand and some time was taken to ensure all the cambium layer was removed. This involves scrapping the heartwood to get rid of any dregs remaining. Time is also taken to ensure that the top edge is clean with no ragged bits. This is important as a callus must form first before roots will grow. A callus will struggle to form well on a rough edge with damaged cells. A sharp knife is essential here. Now the area is prepared, we apply sphagnum moss around the selected area. Some people will use rooting hormone at this point but I personally find little difference. If it’s going to root, it will! An extra set of hands at this point is a big help. 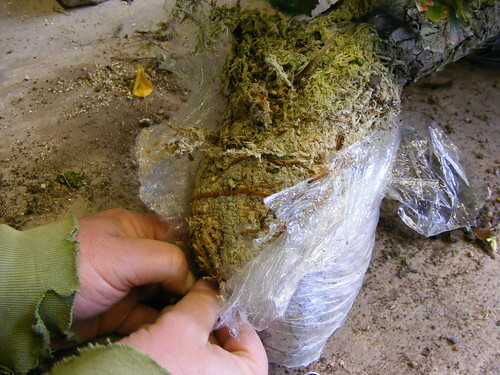 Here we use cling film to hold the moss in place. If you over do the cling film, you will make it harder to see roots appearing in the weeks and months ahead. It’s easy to get carried away! 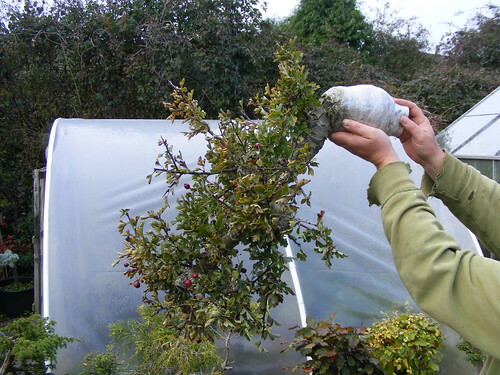 Once we have this done, a strip of old pond liner is used to cover up the cling film. This does a few things. It allows me to remove and check on root growth during the year. It keeps the area free of any late frost and helps keep an even temperature inside. Roots only in cling film will turn away from the light. During the Summer I ensure that I water the area making sure the moss doesn’t dry out. I also turn the tree to keep all areas exposed to direct sunlight. Checking the cling film every week or so I can see that it appears to be working. Fast Forward to October and you can see below that the tree has grown well during the Summer. Longer shoots have been trimmed as required. As often happens when air layering, the trunk has issued new shoots below the layer on very old wood. 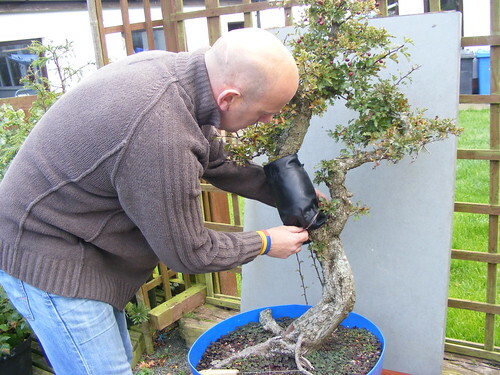 This is an added bonus for bonsai if a lower branch is required. If I had checked and found no roots I would have covered it up again and left it until Spring. If Spring came around and there was still no roots I had two options. 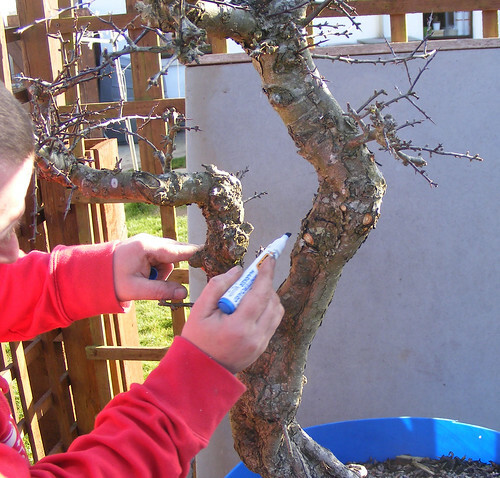 Cut it off and carry on with the original plan of one tree or, re-trim the top edge and reapply the moss and go again. The pond liner is removed and we await the moment of truth. I am confident that there will be enough to support the layered tree so I leave the cling film in place and cut the layer off. By leaving the film I ensure no damage will be caused to any fragile roots. The layer is removed and you would think I would look happier about it. Scowl much? This is what remains and I can begin work on this during the Winter. Areas of deadwood will need to be created to disguise the cut point. You can clearly see the new strong shoots at the base in this photo. Philip has joined me again for the removal and he suggests that the layer may also work as a cascade in the future. 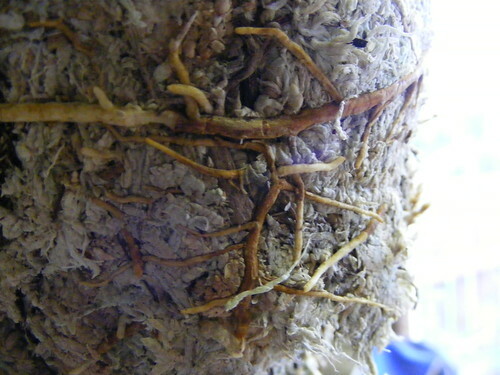 The cling film is carefully removed and roots can clearly be seen in the sphagnum moss. Here’s a close up of some of the roots. 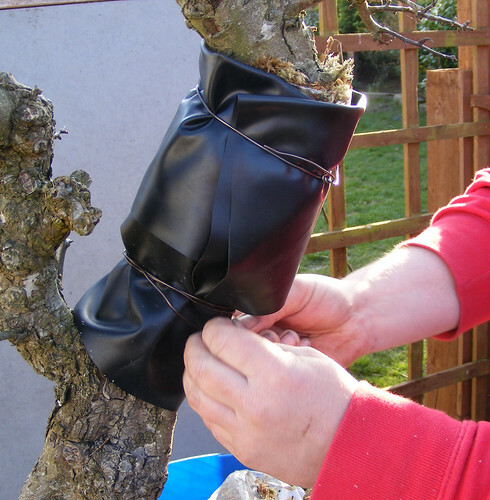 The moss is left in place and the layer is potted into a sturdy plant pot. To remove the moss now, would likely cause more damage to fragile roots. Much better to leave it until the next repotting in a few years. The layer was placed into my poly tunnel to give a few extra weeks of warmer temperatures and give extra protection over the Winter. I have tried 6 layer this year and all but one was a viable layer. The failure was, most likely, down to my lack of watering. 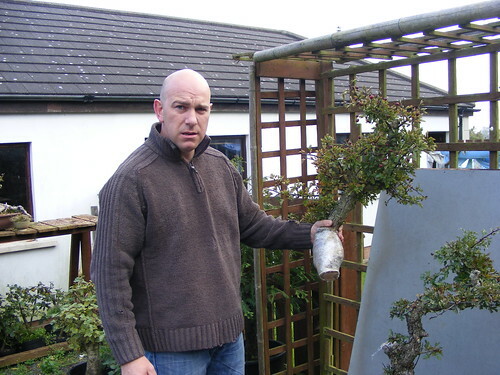 This is a fantastic way of increasing your stock of bonsai raw material and one everyone should be trying out for themselves. This isn’t the only way to layer, nor is it necessarily the best way to layer, but it is the way I do it! 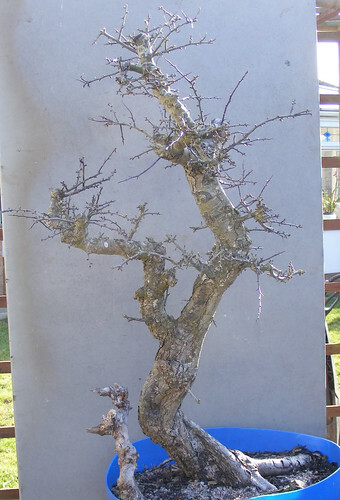 I’ll keep you posted with how this new hawthorn progresses next year. 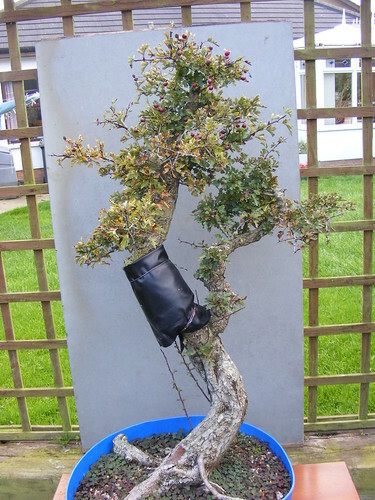 As an extra to this case study I thought I would also show you a few photos of one of Philip’s little Cotoneasters that he layered this year. 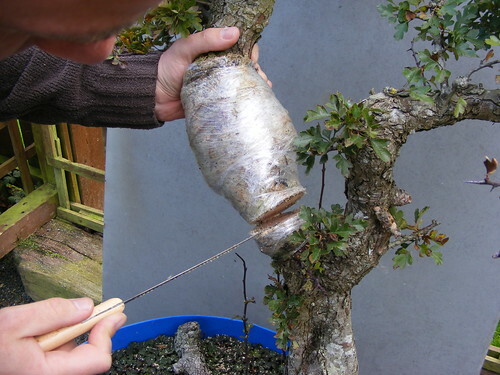 He removed the layer in October and potted one of them into a clear plastic pot. This was an experiment to see just how quickly a layer will root in it’s new medium once removed. These photos where taken just one week after potting and the resulting root growth was fun to see. Thanks. Great article and very helpful photos. I am air layer hawthorn at the ground level. I plan to create a “box”…lined and covered similar to how you have wrapped the tree. 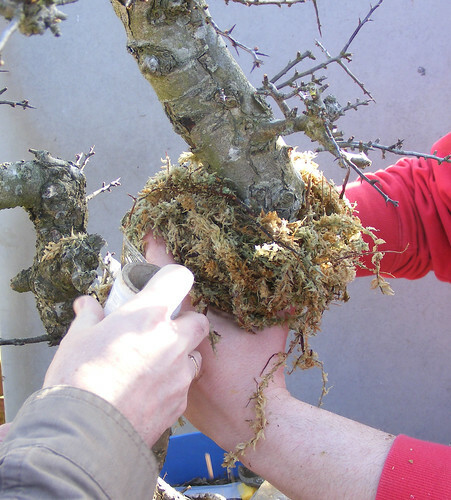 Then, when the time is right…plan to cut the trunk below the box that is stuffed with the Spag Moss. Thoughts? Do you think this would work? Tips? Thanks John. Sounds like your plans for the Hawthorn will work fine. If it’s an open box make sure you keep up with the watering. That’s why I like the sealed cling film approach. Hope it works out for you.